"Hispanic Customers for Life by Isabel Valdes"
Best-selling author Isabel Valdés believes wholeheartedly in the power of in-culture and share-of-heart marketing. In this book, her most recent, she shows how the U.S. Hispanic market is shifting from a majority of customers who are unacculturated to a majority who were born in the United States and are melding the two cultures together in ways that make them an unprecedented marketing challenge. The Hispanic market is experiencing its most important socio-demographic and cultural shift since its emergence as a powerful and distinct U.S. market segment. Hispanic Customers for Life: A Fresh Look at Acculturation, explores the present “Hispanic generational crossover,” providing insights, data and tools to manage the generational and acculturation differences among U.S. Hispanics, immigrants and their U.S. born offspring. Ms. Valdés, a marketing expert, is recognized as the creator of the “In-culture” marketing approach. A lecturer and public speaker, Ms. Valdés has been studying and writing about the Hispanic market for more than 20 years. Her earlier books, Marketing to American Latinos, A Guide to the In-Culture Approach, Parts I and II, are classics used in many universities around the country and on the bookshelves of most multicultural marketers. Although most news media speak of Hispanic consumers as only or mostly immigrants, in fact, in 2006 only 19.9 million Hispanics living in the U.S. were “first generation” or foreign born, whereas 24.8 million or 55 percent of the total were second, third or more generations and born in the United States. Add the 3.9 million Puerto Rican Islanders—also American citizens—and the true size of the U.S.–born Hispanic market today is nearly 29 million. The growing segment of U.S. born Latinos poses unique business, marketing and communications challenges and opportunities. Ms. Valdés describes how to target them successfully for marketers of all kinds of products and services. The “young millennial Latinos,”—the second generation youth market—children, teens, and young adults born to foreign-born parents. The “traditional Latinos”—those born to Latino families that have been U.S. citizens for two or more generations. By 2016, it will be a different Hispanic market altogether; the vast majority of Hispanics aged 20 to 29 will have been born in the United States. These Hispanic “Twentysomethings” will constitute a significant market segment - well acquainted with U.S. culture, however, as Ms. Valdés emphasizes, “often born to at least one parent who was foreign born.” Thus, straddling two cultures. In an important departure from the usual ways of viewing this market Ms. Valdés segments it by age and generation, highlighting the waves of acculturation per segment, simplifying a complex marketing landscape by helping marketers understand how different levels of acculturation change Hispanic consumer expectations and hence their responses to marketing messages. The Selig Center for Economic Growth at the University of Georgia estimates that U.S. Hispanic purchasing power increased dramatically during the 1990s and has continued to rise into the 21st century, from $212 billion in 1990 to $736 billion in 2005, a 347 percent increase over the 15 year period. Buying power is defined as the total personal (after-tax) income that consumers have to spend on goods and services, or disposable personal income. By 2010, Jeffrey Humphrey, director of the Selig Center, projects Hispanic buying power will top $1 trillion. By 2050, some estimates place the value of Hispanic consumer marketplace between $2.5 and $3.6 trillion. The growing relevance of “emotional marketing” to build HeartShares, the “how to's” and new gold standards are described and illustrated with business case studies. An additional value of the book is a comprehensive list of Hispanic-related websites, including marketing and advertising companies, trade organizations, non-profits, media, and researchers. With exciting new case studies and a directory of internet resources, Ms. Valdés gives you the data and analysis you need to move your Latino marketing to the next level. "Valdes, a pioneer in Hispanic marketing, has produced a well-written and current introduction to the Hispanic/Latino market in the US, offering insight into this complex market segmented by age, generation, and region. The book presents an excellent statistical as well as cultural portrait of this very diverse community using data from the US Census and other sources. The author also covers theoretical frameworks for implementing marketing strategies to the Hispanic community. In addition to business audiences, this work will be useful to people interested in the immigration debate because it presents data that challenge popular perceptions about Hispanics." Recommended for all collections." 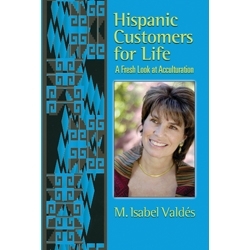 "Isabel Valdés latest book brings a "fresh look" at the U.S. Hispanic market. Moving well beyond Latino Marketing 101, marketers learn how their brands can increase their share of the market with the growing Latino consumer and why there is no one-size-fits-all strategy for this important market segment. Hispanic Customers for Life is the most insightful book to date for marketers seeking to evolve their strategies for capturing the opportunities from within the U.S. Latino market." "Isabel's book is full of relevant facts and insights. Equally important, she reveals winning strategies from leading companies in multiple sectors who are successfully capturing the hearts and minds of Hispanic consumers. At PepsiCo we have benefited greatly from her intellect and sound advice."